Is embodiment behind our love of certain characters? When Twilight first became popular, I heard many observations (criticisms?) like this one that teen girls are so enraptured by the books because Bella, the main character, is extremely non-descript. She’s an “empty shell,” which makes it so that “any female can slip into it and easily fantasize about being this person.” This makes sense, and it rings true when I think about the books I liked when I was younger: the characters had something in common with me, and I usually chose to disregard the traits we didn’t have in common. 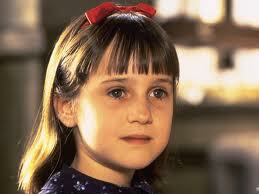 Even movies: I loved Matilda, and as I look back on it, I realize that I was (am?) almost as book-obsessed as she, and we even have a pretty strong physical resemblance. The acknowledgment that stories are more interesting when we can imagine ourselves in them is not new. But recently as I was thinking about this, I wondered: does this have anything to do with embodiment? If our bodies constitute the foundation through which we experience the world, are we able to experience it more vividly when we can actually imagine our bodies in the story? Embodiment is intimately connected to the idea of simulation – even when we’re not using our bodies, when we’re thinking about something, we mentally simulate that doing that action or seeing whatever object we’re thinking about. Is that what draws us to certain stories and is that why I could never get enough Matilda? !